Having twins? What a Blessing! A fantastic gift for any new mom and her little bundles of joy! 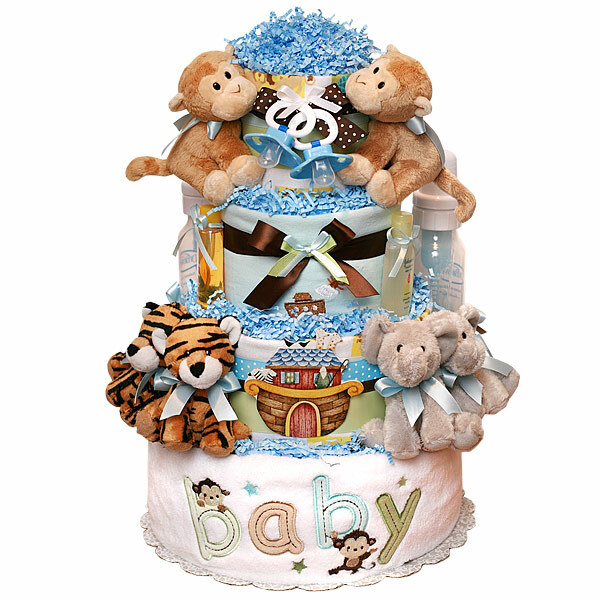 Four tiers Twins Noah's Ark Diaper Cake is a great baby shower gift and a gorgeous centerpiece for a Noah's Ark themed baby shower. Can also be used to welcome new babies in the hospital room. This diaper cake is made of 70-75 Pampers Baby dry diapers size 1 (8-14 lbs. ); One super soft white blanket; Three flannel receiving blankets 100% Cotton with Noah's Ark theme; two plush tiger toys; two plush elephant toys; two plush monkey toys; two pacifiers; Two Dr.Brown's baby bottles; One JOHNSON'S Baby Powder Pure Cornstarch with Aloe Vera & Vitamin E 1 1/2 oz; One Johnson’s HEAD-TO-TOE Baby Wash 1 fl.oz; One DESITIN Creamy 1/8 oz; One Johnson’s Baby Shampoo 1 fl.oz; One JOHNSON'S baby lotion 1 fl.oz.